New Improved! - Chemically damaged hair need protein to refill the gaps in the hair's cuticle caused during processes such as dyeing, bleaching, perming, or relaxing. 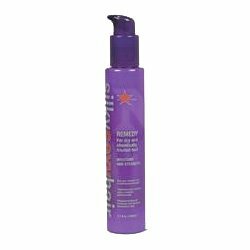 Remedy balances strengthening Silk, Soy and Wheat proteins with protective silicones to fill gaps and lock in needed condition and moisture to leave hair super soft, shiny, and well-conditioned. Has a dreamy Vanilla-Grapefruit fragrance.